Since many have undertaken to set down an orderly account of the events that have been fulfilled among us, just as they were handed on to us by those who from the beginning were eyewitnesses and servants of the word, I too decided, after investigating everything carefully from the very first, to write an orderly account . . .
Mark in his capacity as Peter’s interpreter, wrote down accurately as many things as he recalled from memory, though not in an ordered form, of the things either said or done by the Lord. For he neither heard the Lord nor accompanied him, but later, as I said, Peter, who used to give his teachings in the form of anecdotes . . .
Matthew put the sayings in in an ordered arrangement in the Hebrew [Aramaic] language. Regarding the second passage from Papias, some scholars think that the gospel of Matthew was composed in Greek, based on its style, and not translated from a Semitic language. But Papias might still be correct, and what we have is a paraphrase or loose translation. Luke wrote better Greek than Mark or Matthew, and he altered the sayings. John reworked the sayings in the way that Plato used the words of Socrates to compose his dialogues, and John added his own theological ideas about Jesus. Some of the speeches in this gospel, then, are unlikely to be things that Jesus actually said. As quoted, the words of Jesus have a literary quality. They are not spur-of-the moment improvisations or off-the-cuff remarks. After two thousand years and translation to English, they still sound fresh. In addition to the visionary “kingdom of God” and the ambiguous “son of man,” as well as many striking phrases, the sayings have rhetorical style, a gift for metaphor, and the story-telling appeal of the parables. They also sound consistent, the product of a single mind. So I say to you, Ask and it will be given you; search and you will find; knock and the door will be opened for you. For everyone who asks receives, and everyone who searches finds, and for everyone who knocks, the door will be opened. The passage leads to an image of a parent who gives his child food, which in turn leads to this: “How much more will the heavenly father give the holy spirit to those who ask him!” The new image of God the benevolent father is a provocative contrast to the old images of God as an angry king, a destructive force of nature, and a spirit of bloody revenge. This is poetry that stirs people. It explains in part why those who heard Jesus preach were moved. 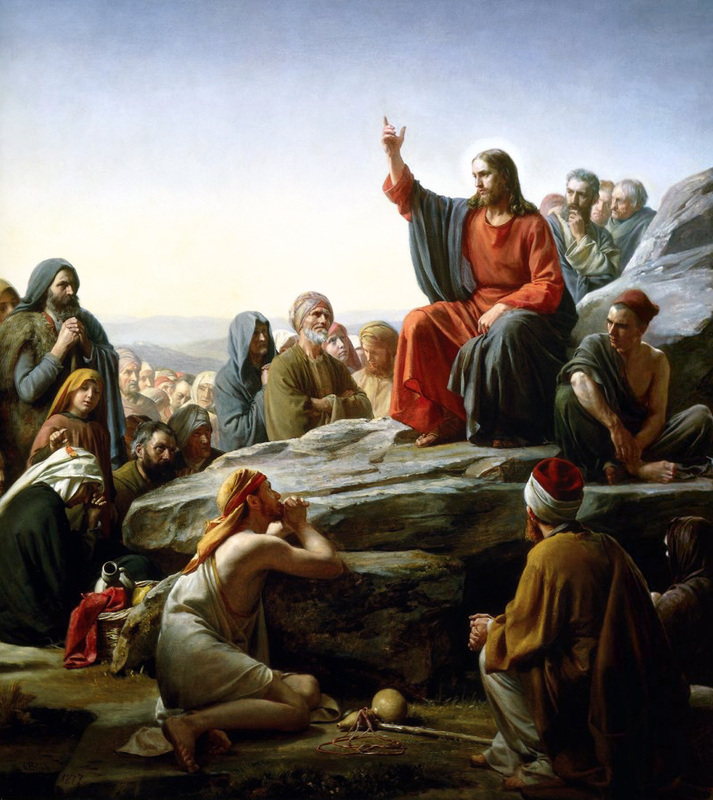 While the Sermon on the Mount and remarks about the rich show Jesus as a champion of the poor, the parables often take a middle-class point of view. They deal with collecting rent, hiring farm laborers, the financial return on investments, legal definitions, taxes, and inheritance. Many today see Jesus as the son of peasants, raised in a backward village, the village of Nazareth. But tekton, the Greek word translated as “carpenter,” can also mean “craftsman” or “builder.” Some critics make the case for Joseph as a small-scale businessman. Nazareth was only four miles from the large city of Sepphoris. Joseph and his son must have gone there. They may have worked in Sepphoris in construction. These are possibilities we can neither prove nor discount. Jesus’s behavior as reported shows a man who is educated, a fact that implies enough family wealth to put him through years of school. The story about him in the Temple at age twelve, given in Luke 2:41-52, may be fiction, or it may suggest that the schooling was in Jerusalem. Jesus’s skill in disputation and his acerbic comments on the temple hierarchy and “the scribes and the Pharisees” imply a close acquaintance with them. Alexandria in Egypt is also possible, with its large Jewish community. The four gospels and the Acts of the Apostles do not mention these Jews, who produced a Greek translation of Hebrew scripture called the Septuagint in the second and third centuries B. C. A connection to Egypt and the Greek language would be interesting. Philo of Alexandria, a Jewish philosopher who wrote in Greek, was a contemporary of Jesus, but neither mentions the other. Most scholars assume that Jesus and his Galilean disciples did not know Greek or Latin, yet the Bible shows them talking to Roman soldiers and officials. What language did they use? On the evidence of places named in the gospels, Jesus traveled widely. He must have known about the Essene community at Qumran, and he may have visited it. He was provincial by origin only. Others address him as “rabbi” or teacher, a term of respect. The scribes and the Pharisees brought a woman who had been caught in adultery. . . . Jesus bent down and wrote with his finger on the ground . 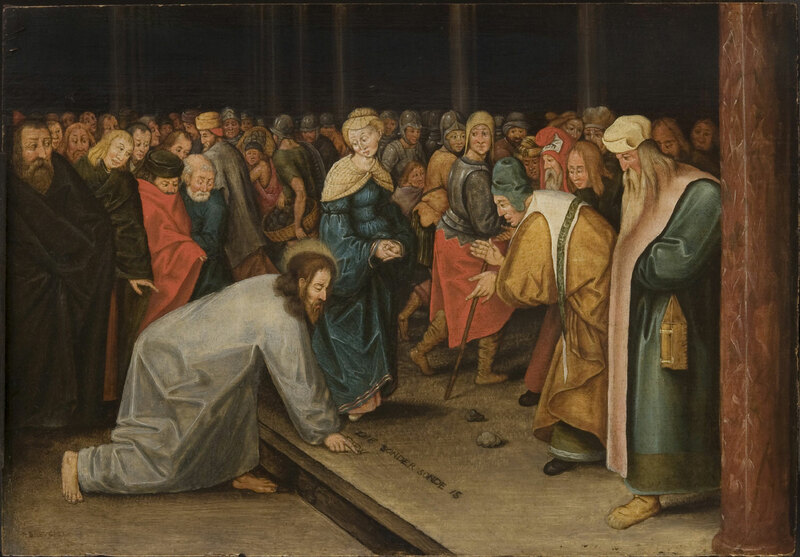 . . “Let anyone among you who is without sin be the first to throw a stone at her.” And once again he bent down and wrote on the ground. The passage does not say what Jesus wrote. Some readers suggest that he wrote an accusation against “the scribes and the Pharisees.” Other readers interpret Jesus’s action as doodling, a way to show his disregard for the temple officials, who “kept on questioning him.” Still other readers dismiss the passage, omitted in some ancient manuscripts, as a later interpolation, a didactic story and not a biographical anecdote. The passage resembles Jesus’s own teaching method. He uses short stories to make his point, stories drawn from daily life, always with a deeper meaning or what we usually call a moral. Examples of these stories, known far beyond their context, are the Prodigal Son and the Good Samaritan. The gospels call the stories “parables” from parabolos, a Greek translation for the Hebrew word mashal. Rabbis who wrote and preached in Palestine at this time used the mashal in this moralistic way. The four gospels and the Acts of the Apostles quote Jesus in the manner of a newspaper, but there is no way to verify the quotations. Even so, rationalists pick and choose which events and speeches strike them as plausible. The major stumbling block, to use a Christian phrase, is the miracles. To take one example from the late eighteenth century, Thomas Jefferson cut and pasted a version of the New Testament which he titled The Life and Morals of Jesus of Nazareth. It excludes all mention of the supernatural—the resurrection is absent—and it includes what Jefferson thought to be authentic words and deeds. Lacking external checks, scholars weigh internal evidence. They use the method of textual interpretation, also used to analyze Greek, Latin, and other ancient texts. Pioneered in Germany in the nineteenth century, this type of research shows that ancient writers sometimes used earlier texts to compose their own. In the gospels of Matthew and Luke, the writers may have copied a document called Q for Quelle, the German word for “source,” as proposed in 1838. Scholars assume that the language of Q was Greek, like that of the gospels. Yet the language of Jesus and his Jewish followers was Aramaic. How did the shift occur? The Q theory has been widely discussed in the German- and English-speaking world for more than a century. American seminaries and divinity schools include the theory as part of basic instruction. The textbook The New Testament: A Historical Introduction to the Early Christian Writings by Bart D. Ehrman, a professor at the University of North Carolina and a popular writer on the subject of the historical Jesus, gives a summary called “The Contents of Q.” Ehrman warns that “we cannot know the full contents,” and that a “widespread view is that Q . . . consisted entirely of sayings of Jesus, and that it was therefore very similar to the Gospel of Thomas . . .” In Ehrman’s summary, Q includes parables, proverbial sayings or aphorisms, the Lord’s Prayer, the Sermon on the Mount, the Beatitudes, and stories about the life of Jesus that look like parables, such as the Temptation in the Wilderness. At times, Ehrman takes care to note that Q is a theory, not a fact. At other times, he and like-minded scholars take Q for granted. Absolute proof in the form of an ancient manuscript is unlikely to turn up. The situation resembles the “theory of evolution” and the incomplete evidence that supports it. Although Jesus’ mother tongue was Aramaic, his sayings had been largely translated into Greek for missionary purposes. Then they were collected into small clusters, which were eventually brought together into the Sayings Gospel Q. The Q people would seem to have been the disciples of Jesus who had stayed behind in Galilee. Some were originally itinerant . . . wandering from door to door with Jesus’ message, as is evident from the mission instructions in Q. Yet the lack of success in winning over appreciable numbers of Jewish converts led to disillusionment, over against an invidious awareness of the success of the Gentile mission. This picture of “the Q people” and their “disillusionment” is speculation. Robinson pushes the theory farther than the facts will go. It is reasonable to think that after the crucifixion, people in Galilee remembered Jesus and repeated his sayings, perhaps for as long as thirty to forty years. Did some of the twelve disciples return from Jerusalem to live in Galilee? Did they and other Galileans form a group of Christians? Were they distinct from or allied with the ekklesia or “church” in Jerusalem led by James? Did they envy the churches in Syria and Greece? On these points, we have no evidence. An oral tradition is not a perfect record of the original words and deeds of a person. Research on oral traditions around the world has exposed the myth of exact transmission in non-literate societies. Successive tellers garble the message, lose the structure, and introduce varied points of view. Yet the sayings of Jesus remain coherent, striking, and literary. I suggest that Jesus composed his parables, sermons, proverbs, and other sayings in writing. Though he may have known some Greek, he probably wrote in Aramaic. He then delivered his compositions aloud, speaking to crowds in the open air, to congregations in synagogues, and to individuals. To take my suggestion a step farther, the texts then passed to the twelve disciples, some of whom must have been literate, since Jesus trained them as preachers. He or they or a later follower then compiled a handbook. Today such a handbook would be called a list of talking points or a stump speech. This document was then translated into Greek, and the Greek translation is what scholars call Q. Comments on their sources by Luke, John, and Papias do not rule out my suggestion. Luke specifies written accounts, and Papias on Mark might be referring to the gospel or to an Aramaic Q. If the latter, who translated it? As for where, the churches at Antioch and Damascus are likely. As for why, the Acts of the Apostles and the letters of Paul describe a rift between Jewish and gentile Christians. If the first group spoke Aramaic while the second spoke Greek, the translation may have been an attempt to mend the rift. The gospels of Thomas and Marcion and other non-canonical books show that a range of manuscripts and translations existed in Greek, Coptic, and other languages. Many assume based on comments in the gospels that Jesus’s ministry lasted one year or three years, from about age thirty to his death. This is a short time for a rural preacher to develop a repertoire and build a reputation. Where was he, and what did he do in his twenties? In the gospel of John, Chapter 1, he meets John the Baptist in the River Jordan, where the Baptist calls him “the lamb of God” and says, “This is he of whom I said ‘After me comes a man who ranks ahead of me . . .’” This is often read as a supernatural recognition, but it can mean that Jesus was already well known. Given the vague timeline in the gospels and their narrative compression, it is possible that he was active longer, perhaps for ten years. During that time, Jesus traveled, preached . . . and probably wrote. About the Author: Robert Boucheron grew up in Syracuse and Schenectady, New York. He has worked as an architect in New York City and since 1987 in Charlottesville, Virginia. His short stories and essays appear in Bellingham Review, Fiction International, London Journal of Fiction, New Haven Review, Saturday Evening Post, and other magazines. This entry was posted in Uncategorized and tagged Gospel, Jesus, John, Luke, Mark, Mashal, Matthew, Parables, Robert Boucheron, Sayings, The Bible, theology. Bookmark the permalink.